Why did Gandhi hate iodine (I, 53)? Why did the Japanese kill Godzilla with missiles made of cadmium (Cd, 48)? How did radium (Ra, 88) nearly ruin Marie Curie's reputation? And why did tellurium (Te, 52) lead to the most bizarre gold rush in history? The periodic table is one of our crowning scientific achievements, but it's also a treasure trove of passion, adventure, betr Why did Gandhi hate iodine (I, 53)? Why did the Japanese kill Godzilla with missiles made of cadmium (Cd, 48)? How did radium (Ra, 88) nearly ruin Marie Curie's reputation? And why did tellurium (Te, 52) lead to the most bizarre gold rush in history? The periodic table is one of our crowning scientific achievements, but it's also a treasure trove of passion, adventure, betrayal and obsession. The fascinating tales in The Disappearing Spoon follow carbon, neon, silicon, gold and every single element on the table as they play out their parts in human history, finance, mythology, conflict, the arts, medicine and the lives of the (frequently) mad scientists who discovered them. Why did a little lithium (Li, 3) help cure poet Robert Lowell of his madness? And how did gallium (Ga, 31) become the go-to element for laboratory pranksters? 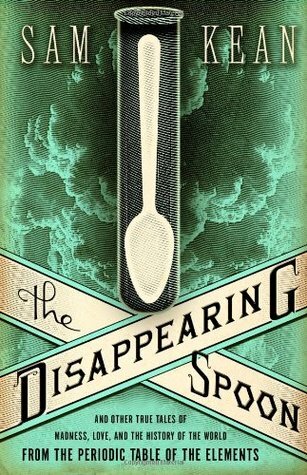 The Disappearing Spoon has the answers, fusing science with the classic lore of invention, investigation, discovery and alchemy, from the big bang through to the end of time.